This is megapack 4 of 4.Arcade Summer brings you a full preset library for the TAL U-NO-LX in the form of 4 insane megapacks. Each pack contains ..
Volume 1 is not enough?Road to Arcadia carefully crafted the Diamond Series vol.2 for SPIRE,127 unique presets to create , experiment and enhance your..
Robovox Synthetic Human Vocals is a great pack with everything from synthetic human voices, to wet/dry fx, a few bonus stuff to inspire you, C64 filte.. This bank contains 64 presets for the VST Sylenth1 which covers retro genres such as Synthwave, Italo & OutrunThis also includes the Ableton file ..
A download pack of 64 original patches for the Korg DW-8000/EX-8000 synthesizer.In the sysex format.Both as a SYSEX bank patch, but also in individual program patche..
A download pack of 64 original patches for the Korg DW-8000/EX-8000 synthesizer.In the sysex format.Both as a SYSEX bank patch, but also in individual program patches for your convenience. If you're into retro synth based music like Synth-pop, Synthwave or Italo Disco or anyother they should suit your style. Even composers for games and movies should find great stuff here. The Korg DW-8000 is a hybrid digital/analog synth that has much in common with the more costly PPG system at the time. It sounds absolutely glorious, but is often overshadowed by more famous synths like the Yamaha DX7 or the Roland Jupiter/Juno series. The Korg DW-8000 can mimic both of these, at the same time, but it can definitely hold it's own. 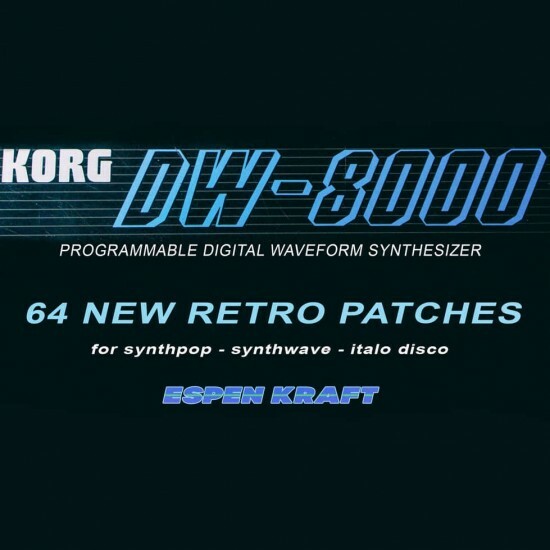 You'll need a MIDI interface with MIDI in/out and a MIDI SYSEX transfer program to load the patches into your Korg DW-8000. I recommend UNISYNTH to do that. It's a free program. Product is digital and doesn't require shipping! Subscribe to see the latest synthwave secrets & video demos.